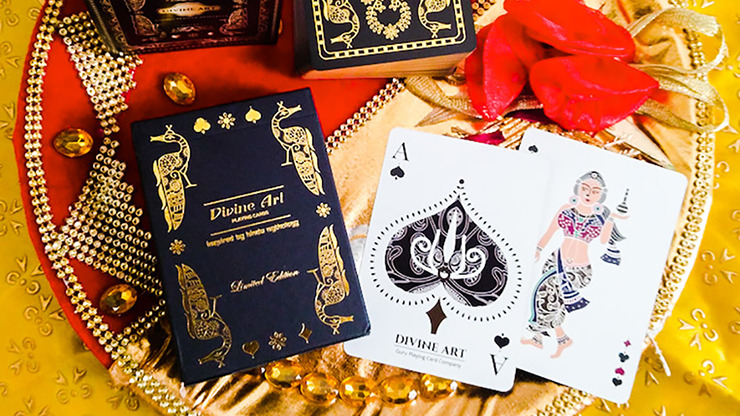 Divine Art Playing Cards takes a regular playing card deck and turns it on its head by combining it with Hindu Mythology. After Ganjifa, this project is one of the first that captures Hindu Mythology in a deck of playing cards. The basis of the Indian world view is of Cosmic unity underlying the physical diversity of the world, through which man transcends himself. Since almost every Indian folk art form is based on Hindu mythology, for the Kings, Queens and Jacks of each suit, various Gods and Goddesses as well as their mounts (vahanas) are taken as inspiration. Millions worship these deities daily in India and abroad. Please note: Although these are brand new decks you may find some minor creases in the corners of the tuck case and loose cellophane. The cause of this is a combination of the oversize tuck box to accommodate the booklet and the way they were shipped. Rest assured these are very minor and you still may get a near perfect deck. If it wasn't for these minor inconsistencies the deck would retail for twice as much.